I didn’t mean this week to be all about breakfast, but it just sort of happened. First, I shared a recipe for Pumpkin Cinnamon Streusel Coffee Cake-yes, you can eat this cake for breakfast. You have my permission:) Next, I posted a recipe for Whole Wheat Apple Cinnamon Pancakes with Cinnamon Syrup. Well, those pancakes inspired me to make a batch of Apple Cinnamon Granola. I love eating this granola for breakfast, especially during the fall months. 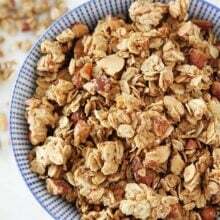 Homemade granola is the best and I love switching up the flavors. I used applesauce to make this granola and only a little bit of oil. The applesauce makes the granola extra crunchy and you get those big clumps of granola. This granola is not wimpy at all! I always pick the granola clumps off of the pan and pop them into my mouth while the granola is cooling. The applesauce also keeps the granola low-fat. Yay! I chopped up some dried apples and tossed them into the granola after it was done baking. I didn’t add in any nuts, only pepitas, because Josh is allergic to nuts. You can throw in pecans, almonds, or walnuts if you wish. This granola has enough crunch and flavor that I don’t miss the nuts though. This nut-free granola is a winner! 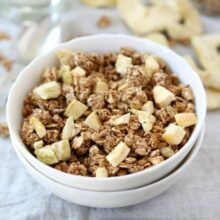 I love eating this Apple Cinnamon Granola for breakfast or for a healthy snack. It is great by the handful, with Greek yogurt, or with a splash of cold milk. 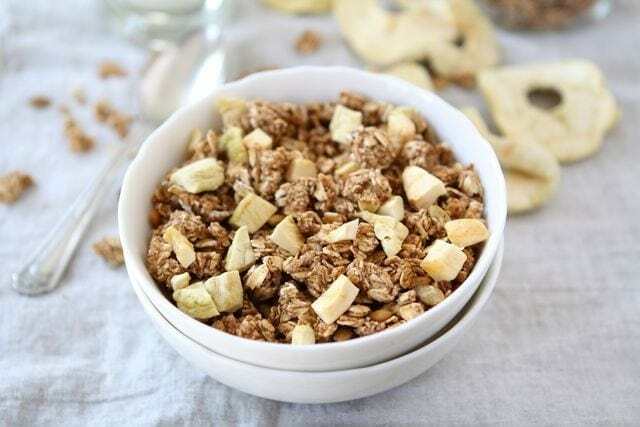 Make your house smell like fall and make a batch of Apple Cinnamon Granola today! This healthy and nut-free granola is great with yogurt, milk, or by the handful! 2. In a large bowl, mix together the oats, pepitas, brown sugar, cinnamon, allspice, and salt. 3. In a small saucepan, warm the applesauce with the honey, canola oil, and vanilla extract. 4. Pour the liquid ingredients over the dry ingredients and stir until well combined. Spread the mixture evenly on a large baking sheet. 5. Bake the granola for about 45 minutes, stirring every ten minutes, until the granola is golden brown. Remove from oven, and stir in the dried apples. Let the granola cool completely. Store the granola in a large, airtight container. The granola will keep for up to one month. Dried apples are so delicious! I bet they’re perfect in the granola and add such great texture & flavor! I love that you made this with applesauce and cut down on the oil! Love that it’s nut-free, too – I could give it to my little one who is not quite ready for nuts yet. Looks delicious, and love that it’s low fat! Can’t wait to give this a try. I keep meaning to make my own granola, and this looks like a wonderful recipe to start with! Looks awesome– what a great recipe! You are so right about homemade granola being best and this looks wonderful with the addition of dried apples. Umm, I bet each bite has that velvety texture. LOOOOVE granola, and dried apples. This looks great — handy for keeping in my purse for when I get hungry!! This looks so healthy and delicious! 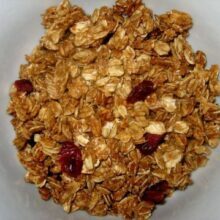 LOVE granola ~ a great recipe Maria! Looks wonderful! 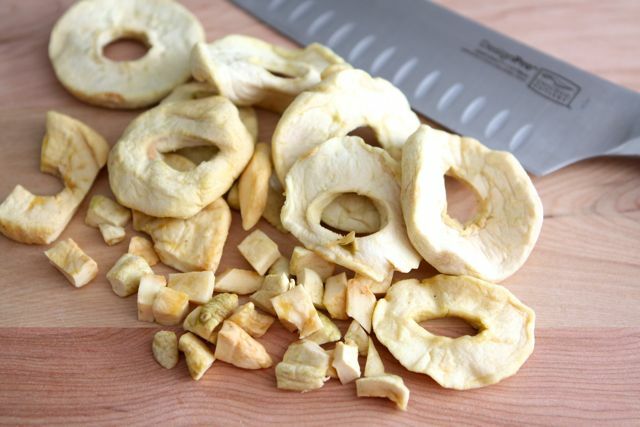 Did you make your own dried apples for this? I am so into granola and oatmeal right now. This is a perfect Fall treat! 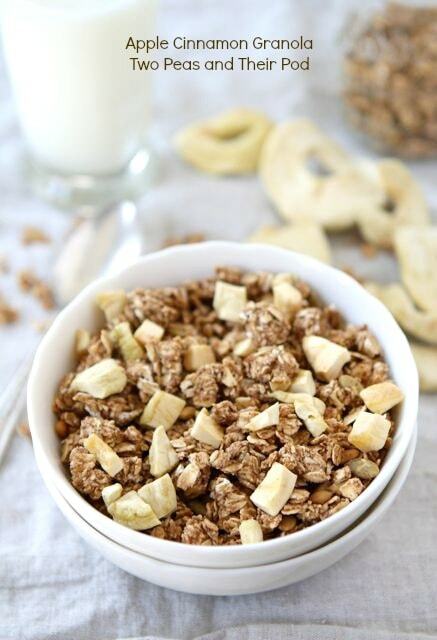 apple cinnamon is one of my favorite flavors – i love it in granola form! Love Apples and Cinnamon especially this time of year! My husband cannot get enough of granola. Meant for us! 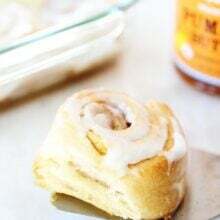 Apple cinnamon is just PERFECT for breakfast so you shouldn’t be sorry at all! I’m loving the sound of this granola. Homemade granola with warm apples and cinnamon — sounds like a wonderful way to enjoy the flavours of Fall! Love the fall twist on it with the dried apples. YUM! I love the lack of oil in this! 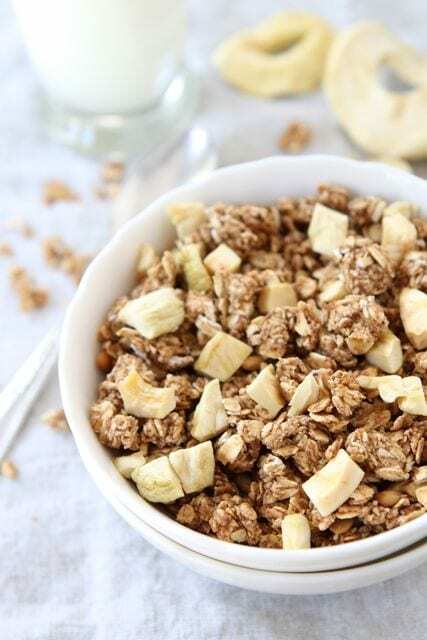 The oil is usually what keeps me away from homemade granola recipes…But maybe not this one! What a great granola recipe. I love the apples in there, so yummy! This sounds delicious! I love making granola but I’ve never thought to add dried apples. I might make some this weekend. Mmmmmm. I LOVE homemade granola! It’s the best blog reading snack. Epescially with those big chunks of apple! I love homemade granola and this one looks SO perfect for the season. I’ve been apple obsessed lately! I just had a conversation with my mother in law about granola. I wondered if there was a way to make it lower in fat. And here it is! Thank you! I have to try this and share your recipe with her. I’ve been consuming a lot of granola lately. Need to start making again. Thanks for the inspiration. Apple cinnamon just screams fall to me. 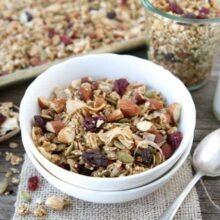 I need to change up my granola every once in a while… next time I’m trying this! I love making homemade granola as well! I’m baking this right now. It is currently smelling scrumptious. Thanks for sharing another yummiliscious recipe. What if you made this with regular apples (not dried), mixed them in at the beginning, and let them dry out in the oven during the baking process? Would that work? One of my daughters-in-law is allergic to nuts and I have tried in vain to find granola without nuts. I was going to try and adapt one of the many recipes I have by substituting pepitas. Thank you, thank you. You’ve made it easy for me. This recipe looks great! I’m starting it up right now 🙂 I’ve got wayyy too many apples this fall and need all the ideas I can get. Pinning this! Thank you for this recipe. I am a single male in my 40s. I have been working from home for the last 3 years so I have been learning cooking and baking. Previously, I have almost always ate out for 20+ years. So I’ve been enjoying trying new recipes for quite sometime. I exercise a couple of times a day and I crave for sweet stuff at times. Protein bars are usually too sweet for me and they are also quite expensive and leave a big hole in your budget. For this recipe, I have used the leftover cinnamon applesauce I have made last week. I wanted to use it for some crunch healthy snack and that’s how I came across your recipe as well. I have also added a cup of ON Whey Protein powder (Cream and Cookies) which is one of my favorites. I also like the double rich chocolate flavor which is what I am going to use when I make this next time. I have also added generous amount of flaxseed ground for high-fiber with omega 3 fatty acids. I’ve taken it out of the oven 1/2hr ago. Unlike you, I avoided stirring the granola and made granola bars. My next two batches in the oven are crackers to be made from vegetable pulps I have left from juicing. They have super high fiber foods. I also would like to experiment some of them with these granolas but I think I should only use pulps from fruit juicing since they are sweet and maybe substitute for dried apples which are also not inexpensive.